Income Properties vs. 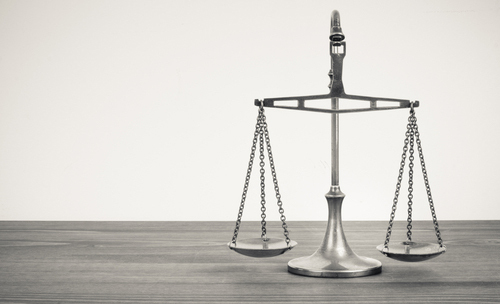 Annuities: Which Do You Choose? Home > Blog > Investing Tips > Real Estate Investing > Income Properties vs. Annuities: Which One is Right for You? Income Properties vs. Annuities: Which One is Right for You? Do you have a plan for retirement? Besides the stock market, investors are looking at nontraditional ways to generate income during retirement. Some of these include annuities and income properties. While both, income property and annuity could offer potential solutions, make sure you’ve done your research before you commit to one. Annuities are a long-term investment designed to give policyholders an income stream for life. While there are many different types of annuities, most of them typically fall into two categories: fixed or variable. Fixed annuities work similar to a certificate of deposit, albeit with a typically higher interest rate. The payments from fixed annuities last for a lifetime and are stable and secure. The downside to fixed annuities is that returns aren’t on par with the stock market or other non-traditional assets. In fact, the returns are capped at a fixed rate (which can sometimes decrease after the first year) and they don’t adjust for inflation. If anything, fixed annuities should be looked at as a subtle addition to other retirement income, as they likely won’t be able to support a comfortable retirement lifestyle on their own. Variable annuities are slightly different than fixed annuities and grow tax deferred based on a selection of investments (stocks, bonds, mutual funds, etc.). The performance of these investments then determines the amount of income the annuity can pay in the future. While most of these investments are contingent upon the stock market for the highest levels of growth, riders can be purchased for an additional fee, which will provide a guaranteed payout for life. 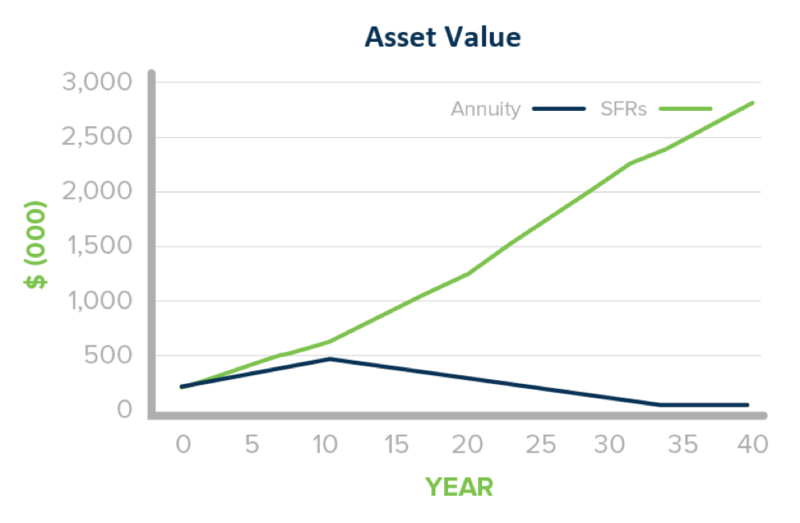 Overall, variable annuities can have potentially higher earnings than fixed annuities, but there is still risk associated with this investment. Depending on how heavily weighted the annuity is in the stock market, the rider might be a necessity, should the markets not perform as expected. Even though these annuities grow tax deferred, there is a heavy penalty that comes with early withdrawals (before 59 and-a-half, like other retirement vehicles) and there are a wide variety of other fees found through management and riders. These fees cut into the overall value of the annuity and can potentially diminish returns. 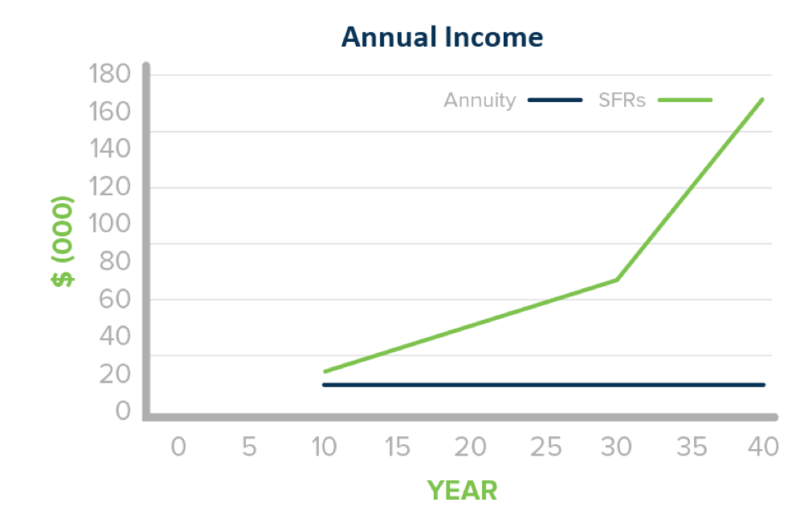 Using an annuity as the main strategy for generating income in retirement is not only risky, it also comes with a heavy price. Even though you can receive monthly payments for life (albeit lower potential returns than other asset classes) all the money you’ve worked so hard to save and grow over your lifetime that is in the annuity will vanish. Annuities are structured to provide income, but after the policyholder passes away, any value left in the annuity will go back to the issuing company. This means the annuity provides zero value to your heirs. An income property is often sought out for the same reasons investors look towards annuities. They provide diversification from the stock markets, generate monthly income (through rent), and have the additional benefit of being a tangible asset that can grow through appreciation. Like annuities, owning income property does have some potential downsides. The initial investment can be high, and like any investment there are risks. Owning income property comes with the difficulty of having to research which markets will present the highest returns and finding quality tenants. A multifamily income property is often quite appealing to investors because of its high earning potential. Consequently, the cost of owning multifamily real estate is much higher than other types of real estate. Also, owning an apartment building or multiplex essentially puts many of your eggs in the same basket. If the major industries shift or a serious layoff occurs in the area it could affect many of the tenants, as vacancy rates could increase in a region. Single family rentals can reap many of the same potential benefits of multifamily real estate but have a lower entry cost and potentially an added layer of diversity. If you purchase a portfolio of properties across the country you’ll be spreading out risk across a variety of markets while simultaneously generating a sizable cash flow. When it does come time to retire you can sell an individual income property out of the portfolio to collect a lump sum of cash, or continue to collect the monthly rent checks for a steady income stream. While real estate does present some potential challenges, it isn’t limited in the same way annuities are. In fact, real estate can grow through appreciation of the asset as well as increased rents over time. This could provide the same lifetime income, yet the asset and the earning power can be passed on to heirs; something you can’t do with an annuity. Whereas it used to be difficult to know which markets to invest in, how to manage an income property remotely, and find quality tenants, there is now an easy solution. HomeUnion® is providing a one-of-a-kind investment solution that takes care of the entire investing process in three easy steps. HomeUnion® starts the process by talking to investors to find out what their investing goals are. This often includes creating an income stream for retirement, retiring early, or building a legacy portfolio of assets that will continue to generate wealth for future generations. We’ll then craft a custom solution to help our investors realize their goals. HomeUnion® has spent a great deal of time researching which neighborhoods and properties present the right level of risk versus reward to provide solid returns for investors. Once the investor decides which income property or properties they would like to put an offer on, we’ll see the entire process through to completion. We’ll take care of all the necessary paperwork, financing options, inspections, and everything else in between to acquire the properties. After the properties close, we’ll continue to take care of the asset by overseeing any rehab and maintenance and then finding qualified tenants. We’ll also do all the heavy lifting once the tenants are in place so you can Be An Investor, Not a Landlord. That means that you don’t have to worry about collecting rent or fixing a broken garbage disposal in the middle of the night. You can sit back and watch your asset grow while HomeUnion® does all the hard work for you. Owning income property can be incredibly easy and is a great way to diversify your portfolio while creating an income stream for life. Sign up for a free consultation to see how you can take advantage of this non-traditional asset class.